Hurricane Dean is a few hours away from passing over/ near Jamaica with Belize, Mexico and Cuba potentially in its path over the next few days. I've been party to an excellent effort over the last 48hrs to marshal spatial data and resources for a post-hurricane response. The extensive team effort behind the scenes that goes into making a MapAction deployment happen is in motion. And people have been pitching-in directly and indirectly, from Jamaica, Belize, the Bahamas, Washington State, Trinidad, Barbados, the UK, Guyana and en route to Ascension Island. It's been very affirming to see. They are both updated several times per day. 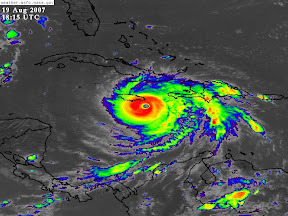 Other interesting links: Find out how hurricanes form and about categories of hurricanes. View custom maps of the current situation in Jamaica in the MapAction Map Catalogue.